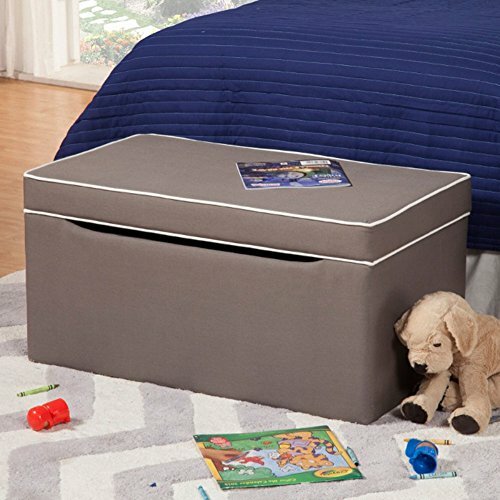 A versatile solution for your child's play area or bedroom, the Kinfine Upholstered Kids Storage Bench - Gray affords you a seating and storage option in one piece. This rectangular storage bench is a natural addition to modern children's decor, featuring a charming gray color with white piping along the top cushion's seams. Sturdy wood forms the frame, covered with a thick layer of foam. Easy-lift hinges provide access to the bench's hidden storage area -- a wealth of space to organize books, toys, clothes, and much more! About Kinfine USA, Inc. Kinfine is based in Chino, California and got its start in 1993. This privately held company provides classical and on-trend occasional furniture, ottomans, benches, fabric headboards, dining chairs, barstools, accent chairs, accent tables, and juvenile furniture. Kinfine is known for providing quality home furnishings at a reasonable price point. Dimensions: 31W x 17D x 16H in.. Long-lasting wooden frame. Soft, thick foam padding. Plush and durable poly-blend fabric upholstery. Handsome gray color with white trim. Spacious lift-top storage area. Dimensions: 31W x 17D x 16H in.